What are VetriScience Vetri Cardio Canine Bite-Sized Chews for Dogs? 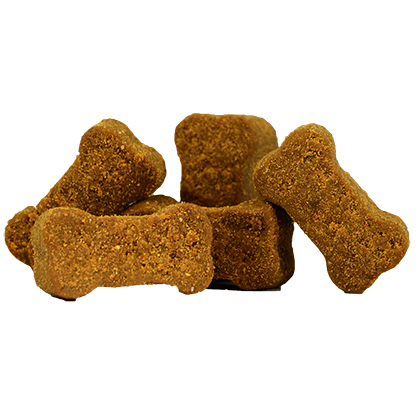 VetriScience Vetri Cardio Canine Bite-Sized Chews for Dogs are tasty chews formulated to support heart muscle and cardiovascular function while reducing oxidative stress. They also help support circulation of the blood and utilization of oxygen. VetriScience Vetri Cardio Canine Bite-Sized Chews for Dogs are recommended for dog breeds predisposed to cardiovascular stress, dogs with sub-optimal cardiovascular function, as well as for senior pets who need cardiovascular support. How do VetriScience Vetri Cardio Canine Bite-Sized Chews for Dogs work? 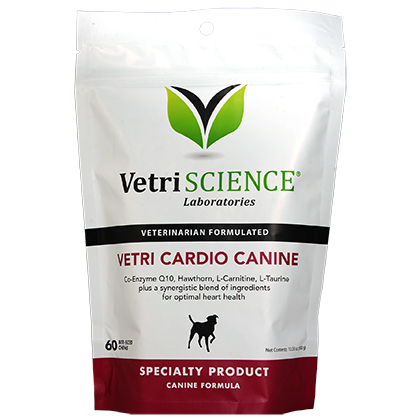 VetriScience Vetri Cardio Canine Bite-Sized Chews for Dogs contain amino acids, Hawthorn Berry Extract, Magnesium, Coenzyme Q10, Folic Acid, and Potassium among other ingredients to help support healthy cardiac (heart) muscle, reduce oxidative stress and promote cardiovascular function. They also support circulation of blood and utilization of oxygen. VetriScience Vetri Cardio Canine Bite-Sized Chews for Dogs are particularly recommended for dog breeds that are predisposed to cardiovascular stress, those with sub-optimal cardiovascular function, and senior pets requiring cardiovascular support. Safe use in pregnant pets or pets intended for breeding has not been proven. If your pet's condition worsens or does not improve, stop product administration and consult your veterinarian. For pet use only. Keep out of the reach of children and pets. In case of accidental overdose, contact a health professional immediately. VetriScience Vetri Cardio Canine Bite-Sized Chews for Dogs are recommended to support cardiovascular health in dogs of all weights. Chews can be divided as necessary according to your dog's weight. If giving more than 1 chew daily, divide between AM & PM. Store in a cool, dry location. Keep out of reach of pets. Other Ingredients: Arabic gum, apple pectin, brewers yeast, calcium sulfate, canola oil, chicken liver flavor, citric acid, glycerin, mixed tocopherols, oat flour, oat meal, propionic acid, rosemary extract, rye flour, silicon dioxide, sodium alginate, sorbic acid, soy lecithin, vegetable oil, water.